After our recent meteorological adventure in which we were suddenly ambushed by Our Perfect Storm, we realized we needed to make some changes. Our “Gee dear, does that storm look like it’s heading this way to you?” weather monitoring system needed an upgrade, and we had the technology onboard to easily do something about it. Thumbing through the manual for our VHF radio, I learned that it was SAME capable. SAME, or Specific Area Message Encoder, is a feature on many radios that allows you to receive specially encoded area–specific weather broadcasts from the National Weather Service. With your radio in weather alert mode, when NOAA broadcasts a weather alert, such as a Severe Thunderstorm Warning, that’s encoded for your geographic area, an alarm goes off on the radio, and it automatically switches to the relevant weather channel. If you happen to be gamming it up on channel 69 talking to another boat about the fish you just caught, it will rudely interrupt you and direct your attention to more important things, such as the funnel cloud headed your way. NOAA encodes these alerts by county, identified by Federal Information Processing System (FIPS) codes. To make it all work, you have to go the National Weather Service’s website and look up the FIPS codes for your geographic area, You then program these numbers into your radio (check your manual for the procedure). In our case, we programmed in the FIPS codes for Escambia and Santa Rosa counties in Florida and Baldwin county in Alabama. For now, that’s our primary cruising area. In the future, we’ll want to actively manage this list. Our radio is capable of storing up to ten FIPS codes, and we’ll want to add the ones for new cruising areas we enter, and delete the ones for those we’ve left behind. Making it all work takes two steps. First, the VHF radio has to be on. We always have it on while underway (it’s not just a choice, it’s the law! ), but until now we’ve generally turned it off as soon as we anchor. That’s about to change. The minimal draw on the battery to leave the radio on is worth the extra security it will provide. The second step is to push the little Weather Alert button whenever we power on the radio. I’ve tested it, and while our VHF will remember what channel was last used and return to it when next powered up, it doesn’t remember being in Weather Alert mode. We’ll have to set it each time. One more item for our pre-underway list. With the help of some FIPS codes, this button becomes very useful. While a bit light hearted, none of this is meant to be funny. With three bodies now recovered and two people still missing, the unexpected storm that suddenly swept through on April 25th has resulted in the largest loss of life during a sailing regatta in US history. At least if there’s a next time, we’ll have some warning. This entry was posted in How? on April 30, 2015 by Robert. This is a cautionary tale about how a little bad luck and a few less than optimal decisions can make for a very interesting day. In this blog we tend to focus on the joys of a life afloat, but it’s important that you know that it’s not all fun and games. We had a wonderful time at the Jimmy Buffett concert in Orange Beach, Alabama, and I’ll write something about that soon. But it was now the day after, and the topic of discussion over breakfast was when to return home. We had paid for three days at The Wharf Marina, and we had the slip for another night. But we had a brisk west wind, which would make for a fine sail home, and there was a 40% chance of isolated thunderstorms forecast, while Sunday (the next day) called for an 80% chance of more widespread storms. Living as we do at the base of a 62 foot tall lightning rod, we’re not big fans of sailing anywhere where lightning hangs out. Since a 40% chance of storms sounded better than an 80% chance, we made the decision to go. Bad luck (or bad decision, we could go either way on this one)—we trusted the weather report. With some thought and discussion, we worked out a plan to clear the slip while broadside to a stiff west breeze, bring the bow into the wind without drifting down onto nearby boats (the marina was packed for the concert) and gain enough speed in the restricted basin to get steerage to make the quick turn to enter the channel and head east. With the help of some dockhands and a few extra lines, we executed the plan flawlessly and probably earned a few boat karma points that we would cash in later in the day. Once headed east, we rolled out the jib and shut off the engine and settled in for a comfortable sail home. 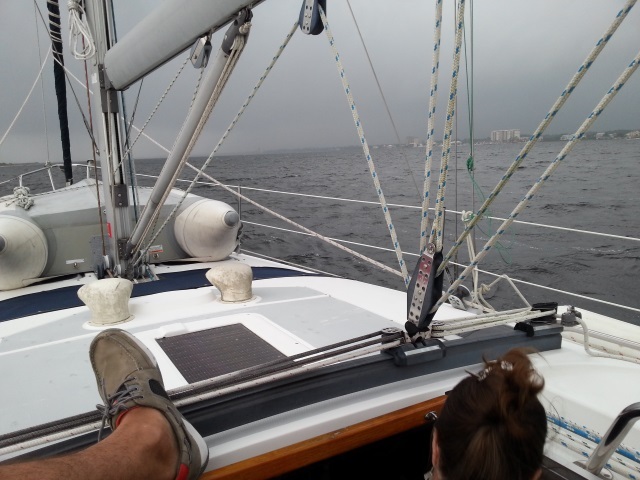 With the wind dead on our stern, we decided not to roll out the main, because the trip along the intracoastal called for a lot of course deviations north and south of east, and having to gybe the boom every few minutes didn’t sound very relaxing. We were making from four to six knots under jib alone, a beneficial current was pushing our Speed Over Ground (SOG) to seven knots at times, and we had no reason to be in a hurry. The skies were partly cloudy, with what appeared to be the normal afternoon coastal front building 10 miles inland. With a Buffett mix playing on the cockpit Bluetooth speaker, we were reminiscing about the concert the night before and totally enjoying the day. Our first indication that something was wrong was when we were overtaken about two hours into our trip home by Sunset Raider, an Elite 32 from our old marina at the Naval Air Station where we used to keep our boat. We knew the crew. They’re racers. They had been tied across the pier from us at The Wharf, as they had also sailed from Pensacola for the concert. But they were motoring, all sails furled and covered. A racing crew that was motoring on a delightful day for a brisk downwind sail. “I wonder why they’re not sailing?” I said to Rhonda. We shrugged and watched them pull ahead of us. After a few moments, Rhonda turned to me and said, “I wonder if they’re running from weather?” We looked over our shoulders back to the west. The frontal boundary we saw building inland, the one we assumed was the usual line generated by afternoon onshore flow, did look a bit darker than when we last looked. 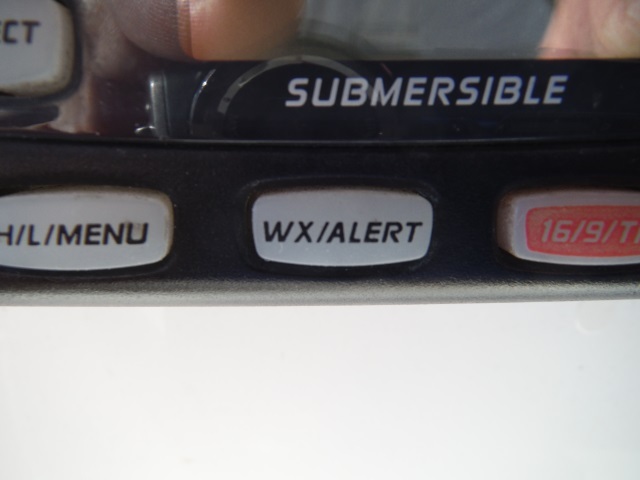 Mistake #1: We always have our VHF on when underway, monitoring channel 16. But since buying Eagle Too last year, I’ve yet to sit down and give the radio manual more than a cursory glance. I know there’s probably a way to program the radio so that it will scan for NOAA weather alerts automatically without having to change to a weather channel, but I haven’t taken the time to do it yet. Mistake #2: Both our cell phones were down below. When I went below to retrieve one, I saw that we had received a Severe Thunderstorm Warning alert on our weather apps. But we hadn’t heard them over the sound of the music we had playing in the cockpit. Now aware of the situation, we checked the radar (on the phone app, we haven’t yet installed our onboard radar) and saw an ominous line of severe storms to our northwest headed our way. We immediately started the engine, rolled up our jib, and made a dash for home. At that time, we were about an hour and a half to two hours out. Leaving the jib up and motorsailing might have given us another half knot, but I thought it best to roll it up in case we were hit by a sudden gust. For a few minutes we thought all was well and we might make it home before the storm hit. But then the air temperature suddenly dropped as we began getting outflow from the approaching storm, and we knew we didn’t have the time to make it back to our marina. We conferred on our options and decided riding it out at anchor would be safer than trying to push on through a potentially severe storm. We were in Big Lagoon at this point, an area we are very familiar with, and which we know has very good holding in sand and soft mud. Having much faith in our Manson Supreme and all chain rode, we worked in toward the south shore, well clear of the intracoastal channel with its steady stream of barges and commercial traffic, and dropped anchor. It left us more exposed to the wind than tucking into the north shore would have, but I feared that if we anchored on the north shore and dragged during the storm, it could leave us dragging right through the channel. By the time I had 80 feet of chain paid out in 11 feet of depth and set the snubber, we could see rain moving across the lagoon and the wind started to build. We took a quick picture, buttoned up the boat and went below to ride it out. While waiting, we set an anchor alarm on my phone and dashed off a quick update on Facebook to let our friends and family know where we were and what we were doing. In a matter of moments, the wind rapidly clocked from WSW to NW. We watched as our display showed the wind climbing through the 30’s, 40’s and into the 50’s. Our boat started violently sailing in large arcs, jerking up short and rolling 45 degrees each time it reached the end of the rode and reversed direction. The wind howled through the rigging, and we held on for dear life. Then the anchor alarm went off. It showed the distance to our anchor point steadily and rapidly increasing. Not only had we broken free, but the anchor wasn’t resetting. We were rapidly dragging down on a four foot shallow a quarter mile to our stern. Grabbing the engine key, I threw open the companionway, dashed to the wheel, started the engine, and began driving the boat into the storm. It took constant wheel and throttle work to stay nose to the wind, because the boat wanted to fall off and come broadside to the gale. But I also had to ensure we didn’t ride up over our rode, because wrapping the chain around the prop would have resulted in us being driven ashore. The wind reached 54 knots, or 62 mph, and the rain was blinding. But at least motoring into the storm stopped the violent rolling. Then, the bimini started coming apart above me, steel tubes and fabric flailing about the cockpit. Rhonda bounded up from below and grabbed the loose frame, holding it tightly with both hands to stop it from flying apart. And for the next 20 minutes, we each fought our separate battles with the storm, unable to offer assistance to each other. I couldn’t stop driving, or we’d be blown ashore, and she couldn’t let go of the bimini frame, or it would rip itself apart. Eventually, the storm passed. It probably lasted about 45 minutes from beginning to end. 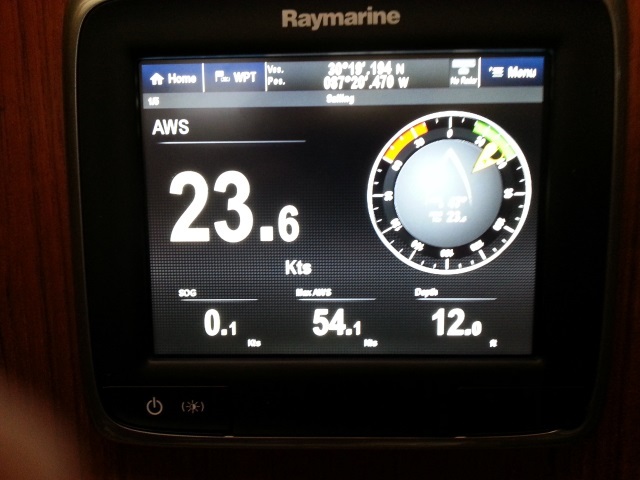 As the winds dropped back into the 30’s and then settled at about 20 knots, the boat finally stopped dragging. We were able to secure the engine, tie down the bimini, and lay below. The radar showed nothing else headed our way, so I made a couple of Thank-God-We’re-Alive celebratory adult beverages and we talked through what had just happened while it was still fresh. An After Action report if you will. It was during this discussion that Rhonda pointed out another error we had made. Mistake #3: We had focused entirely on saving the boat, and completely forgot to save ourselves. While we have an excellent pair of offshore inflatable life jackets onboard, in our haste to deal with the conditions at hand neither of us had thought to don them. After another 30 minutes passed, conditions had improved enough to let us resume our trip home. Weighing anchor, it was immediately obvious what our problem had been. When the Manson broke the surface, I could see that it was completely encased in a ball of gooey clay, studded with bits of shells. I think what must have happened is that our violent sailing at anchor had jerked the anchor so hard that it had dug through the sandy bottom of the lagoon and embedded itself into an underlying clay layer. It had then popped loose a big ball of clay, which clogged the anchor and prevented it from resetting. It was effectively a great big weight rather than an anchor, which is why we kept dragging until the wind abated. Normally I’m a big fan of modern spade-style anchors like a Manson, Rocna or Mantus, but in this case, I have to wonder if a good old plow style might not have performed better. As we completed our trip, we could hear constant radio traffic from sailing vessels calling the Coast Guard or declaring emergencies. We passed what looked like a Catalina 30 with several people onboard that had been driven aground off the Fort Pickens pier. SeaTow was already on the scene attempting to refloat them. The rest of the trip was uneventful, and by the time we made it to our slip, the clouds were clearing and a rainbow appeared. A followup. Since we experienced the storm as an intensely personal event, we didn’t really comprehend its true scale. While watching the news reports the next day, the magnitude of the event was revealed. First, we felt our decision to head home on Saturday was vindicated. 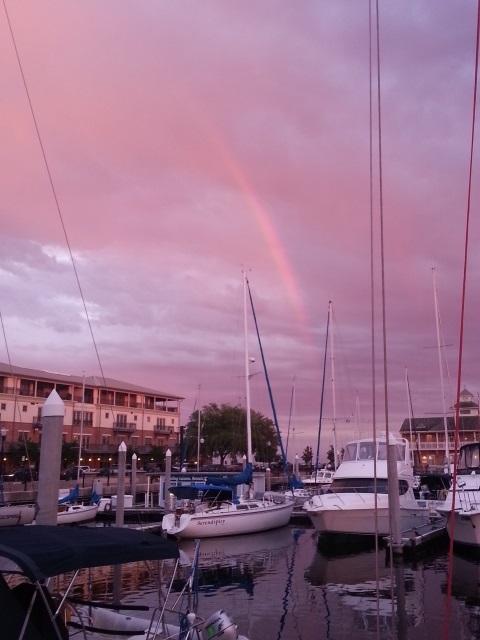 The Fairhope Yacht Club had looked at the same weather report as us, and elected to conduct their annual Dauphin Island Regatta in Mobile Bay, believing that the bad weather would arrive on Sunday. Over 100 boats competed, and the surprise storm devastated the fleet. Sailors interviewed by the local TV news said they had sailed the bay for 10, 20, even 30 years, and no one could remember a storm appearing from nowhere so rapidly. They all held the yacht club blameless, saying that the weather forecast supported their decision to hold the regatta. But much sadder than the boats that were lost was the loss of life. As of the moment that I am writing this, almost two days later, the bodies of two sailors who competed in the regatta have been recovered from Mobile Bay, and the Coast Guard is still searching for an additional five missing sailors. Please pray for them. This entry was posted in What?, When?, Where? on April 27, 2015 by Robert. When I have a bit more time, I’ll post one of my favorite stories. If you’re considering taking the crazy leap of faith and embracing the life of a waterborne gypsie, I think you’ll enjoy It. 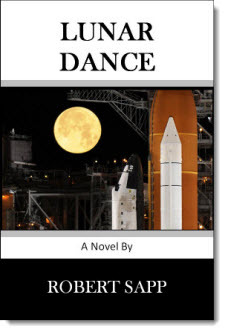 It was an inspiration to me as Rhonda and I contemplated possible futures, and is a wonderful allegory that explores life’s meaning and purpose. (If you know me personally, all I need say is “I see senor, and then what?” and you’ll know the rest.) For now, I just wanted to mention that we sailed to Orange Beach, Alabama yesterday for tonight’s Jimmy Buffett concert at The Wharf Amphitheater, and I spent all day pinching myself to make sure it was real and thinking about that story. I mean, sailing to a Buffett concert – what could top that! I’d never just banged out a quick post using the WordPress Quick Draft tool on my phone before, so I thought I’d try it out. Doesn’t look like I can attach a picture though, so you’ll just have to imagine Eagle Too tied to the pier flying our Margaritaville flags and streaming a Landshark banner up the forestay. Cheers! This entry was posted in When? on April 24, 2015 by Robert. In our first post of this series, we told of our plans to transform the electrical system on Eagle Too to one suitable to support our five (or more) year mission of exploration and allow us to boldly go where few have gone before. In this installment, we begin the task. If you’re not in the mood for something long and a bit technical, perhaps you’d enjoy this LOTH classic from early last year instead: The Ocean Doesn’t Care. Warning—strong opinions follow. Proceed with caution, your mileage may vary, check with your doctor before switching battery types, etc. etc. Batteries. They’re the beating heart of a cruising sailboat. Responsible for providing the lifeforce (e.g. electricity) that powers the many essential systems aboard, their sudden or premature demise can leave the boat lost, dark and lifeless. 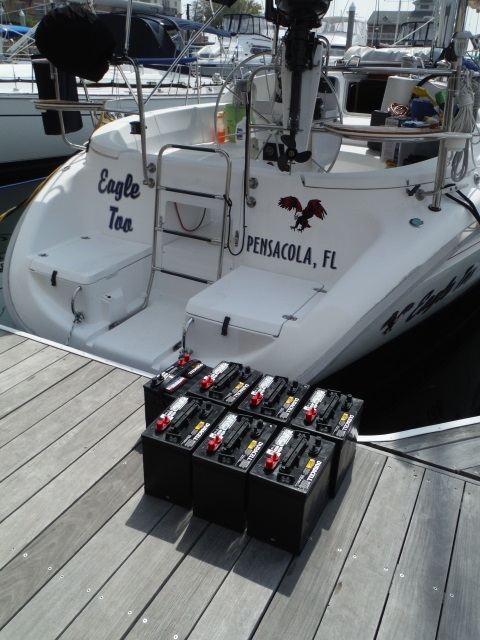 If batteries truly are the boat’s heart, Eagle Too was unfortunately on the transplant list. In an example of that strange but sadly predictable form of temporal distortion I like to call “Broker Time,” the listing broker who sold us Eagle Too described her batteries as “recently replaced.” In Broker Time, something that was done “yesterday” means a couple of months ago, “last month” means early last year, and “recently” means “That was so long ago I can’t exactly remember when.” So it was no shock upon examining the boat to find that our “recently replaced” batteries had 2009 date codes. But it wasn’t worth the trouble to make an issue of it, because we already knew we wanted to add a significantly bigger battery bank to support a Life On The Hook™. Decision #1: What type of batteries do we want? We didn’t have to devote much time to this decision. Flooded lead acid was the clear choice for us. Now I can say with absolute certainty that it’s possible to spend a boat load of money on batteries. But it’s not clear to me why anyone would want to. I realize that there was a time when solar cells were very expensive and very inefficient, wind generators were noisy and unreliable, a towed water generator will only work when you’re underway, and that’s just until a shark decides to have it for lunch, and installing an onboard diesel generator is just stupid expensive. Way back in those bad old days (let’s just call it the 20th century), the best solution for charging your batteries was to mount the biggest alternator your diesel engine could handle and run your engine to charge when the batteries were low. Unfortunately, this is very bad for your diesel engine. Running for long periods at light loads does not a happy diesel make. To minimize the engine runtime and make the most of the money spent on the big honking alternator, you’d want batteries that could bulk charge very quickly. A high charge acceptance rate I believe it’s called. The best ones to use were Absorbed Glass Mat, or AGM batteries. Then gel cells came along, and they became the next big thing. They have a higher acceptance rate than lead acid batteries, at three to five times the cost. But to save the engine all that wear and tear, they were possibly worth it. But this is the 21st century, and the Chinese are cranking out cheap and efficient solar cells by the container ship load. Adding 200, 300, 400 watts or more of solar charging capability can be done in a weekend for one or two boat bucks. Wind generators have gotten quieter, to the point where you no longer have to anchor on the opposite side of the bay in order to not annoy the hell out of all your neighbors. Applying a little thought to your system design and taking simple steps like reducing your electrical demand by switching to LED lighting can probably result in your being able to harvest enough “free” energy daily to keep the batteries charged. Any deficit can be easily made up with a little run time on a portable generator (yes, I know the Honda EU2000i isn’t technically approved for marine use, but this has to be one of the most widely ignored strictures of all time). Space and access constraints. The batteries have to lie on their sides or stand on their ends to fit, which obviously isn’t going to work with a flooded cell. Or the location is very difficult to access, making regular battery maintenance difficult or impossible. You just don’t have the personal discipline to keep up on the maintenance (How hard is it to check the water levels monthly and add a little if necessary? But hey, kudos to you if you admit this shortcoming and have the money to buy the really expensive batteries to compensate). You have so much money to burn that you don’t even check the price of the things you buy for your boat. You just want the coolest, latest, bestest thing possible regardless of cost, like those blue underwater LED lights that make your boat look like the mothership from Close Encounters, or the remote controlled infrared thermal imaging camera that lets you see what your neighbors are doing on their foredeck after dark. No, we knew we wanted to go with the flooded lead acid cells. Yes, you need to check the fluid levels occasionally, and it can be really bad news if you happen to submerge one in salt water. They’ll make chlorine gas, which will pretty much ruin your day, but at this point your boat is probably sinking, so the day is most likely already a write-off. Also, that’s why I’m personally not a fan of having batteries in the bilge. A minor flooding incident that can be stopped before the boat is at risk can conceivably become a lethal event. 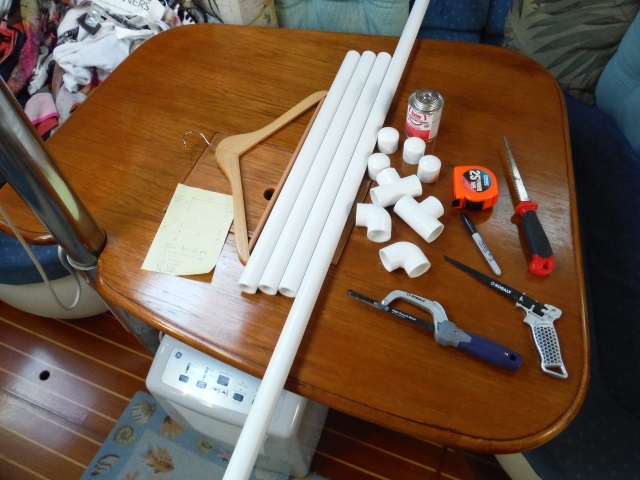 But they’re cheap, will last a long time if properly maintained, and you can do cool things like use a hydrometer to check the specific gravity of individual cells if you’re having a hard to diagnose charging issue (way beyond the scope of this blog post, some other time perhaps). OK, so it’s definitely flooded lead acid. But what type and brand? Again, this didn’t require a lot of thought. 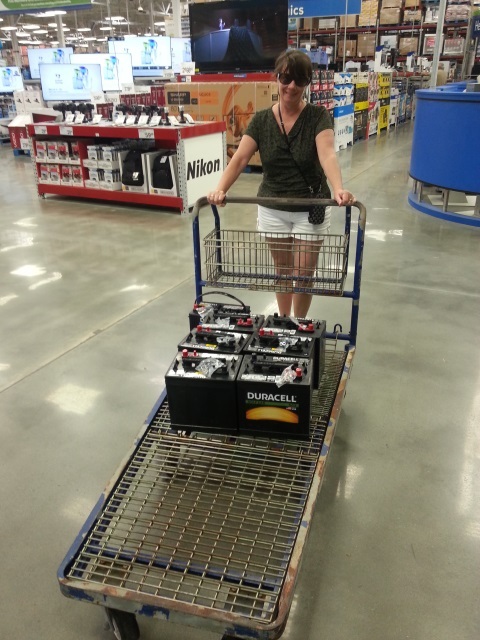 First of all, we went with 6 volt golf cart batteries. They’re built tough. I mean, have you seen the way some of those crazy ball chasers drive those carts? Jumping curbs, tumbling into sand traps, bouncing down fairways as they race to the 19th hole, those carts take a beating and the batteries are built to handle it. They’re also designed to charge quickly and deeply cycle repeatedly. As for the brand, while there appear to be a slew of different battery brands for sale at a wide range of prices, there are really only two or three companies that make batteries. They just put different labels (and prices) on them. For example, you can go to West Marine and buy some very expensive batteries for your boat. Or you can go to Sam’s Club and pay less than half as much. But they’re exactly the same batteries! They both come off the assembly line at East Penn/Deka. The only difference is the label. And the price. So not seeing the value in paying top dollar for a fancy label, we went with the Duracell branded 6 volt batteries (made by East Penn) at Sams. One more quick word about golf cart batteries before moving on. There are in fact a few companies that make a premium battery, for a premium price. Trojan and Rolls are two of the names many are familiar with, for example. But in my opinion, the math doesn’t work. A gentleman who runs a marine service business whose opinion I’ve come to respect has done some pretty extensive testing on a variety of batteries, and he found that if properly maintained and charged, even plain old Walmart brand batteries will give five to seven years of service. If Trojans were going to last twice as long as Duracells from Sam’s, then I could see paying the premium price. But they won’t. If you’re lucky, maybe you’ll get an additional year out of them. Or maybe not. And for the 50% price saving (a Duracell is approximately half the cost of a Trojan), I’m just fine with my measly 215 amp hour battery rating vs. the 225 amp hour rating of the Trojan (Five percent more for only twice the price!). With the batteries now on the pier, it was time to start the installation. 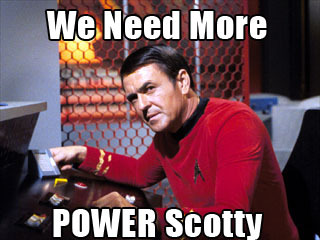 In More Power Scotty! Part Three we’ll look at what was involved. This entry was posted in How? on April 17, 2015 by Robert. With some effort, I managed to capture its image. I shudder as I gaze upon its evil countenance. It is the carbon monoxide detector from Hell. Don’t let its unassuming appearance lull you into complacency. When it strikes, it shrieks with the sound of a thousand tortured souls subjected to the torments of eternal damnation. It is completely and truly possessed. We know carbon monoxide (CO) is a silent killer, and we take precautions to protect ourselves. Not so much because we’d contemplate going to sleep while running our propane heater or generator, but more as protection from those around us. I read a report once of a couple who were overcome in their sleep by CO, the source for which was traced to a generator running on another boat further upwind. Now like most things with the word “marine” in the name, you can purchase a CO detector that’s UL rated for marine use for about four times the cost of a consumer grade equivalent. 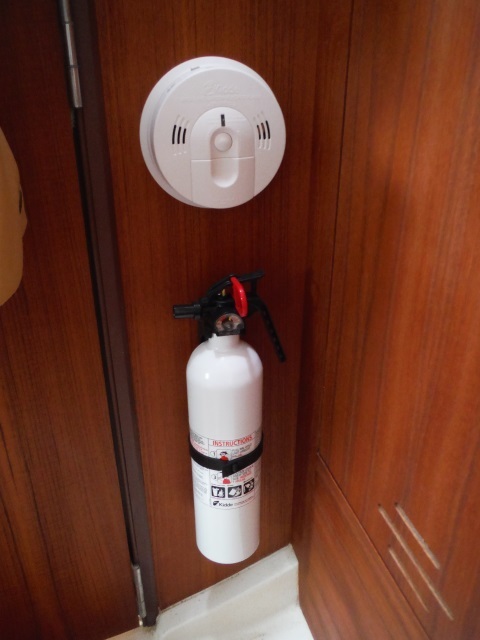 Wanting to provide some level of CO protection but not wanting to drop a significant chunk of change, on our previous boat we mounted a consumer grade CO detector we purchased at Home Depot for $30, and in four years never had a problem with it. So while working through our list of upgrades for Eagle Too, we once again popped into Home Depot and picked up a cheap detector. This time we haven’t been as lucky. On three separate occasions now we’ve been ripped from a quiet and restful sleep by the sound of a firetruck screaming through our aft cabin, punctuated by loud shouts of “EVACUATE! EVACUATE! CARBON MONOXIDE!” Yes, the cheeky little thing speaks our language, and does it with authority. Each time this happened, we were moored in our slip, tied to the pier, plugged into shore power. The air conditioning was running, and the hatches were all closed. Nothing on the boat that could produce CO was operating, and we couldn’t hear any sounds from outside the boat that would indicate an external source. Maybe the damn thing was just lonely. Or possibly bored. Watch me make the people jump may have been running through its little battery powered mind. All I know is that once is a fluke, twice indicates there may be a problem, and three times says “this damn thing has got to go.” I would think that if we truly had some mysterious and unidentified source of CO onboard, we’d see it at times other than 3AM. And when we finally yanked the little shrieking demon off the bulkhead and threw it on the chart table, it quit its crap and started behaving. 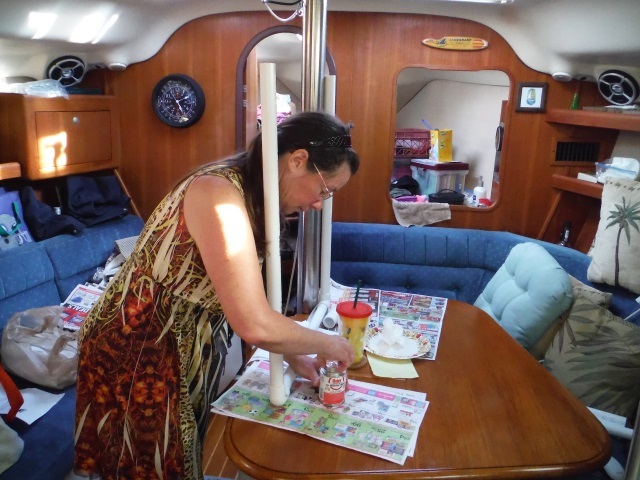 Are the aroma beads Rhonda likes to place in the aft cabin to blame? Something we’re using to clean the head? Late night engine farts? Who knows. 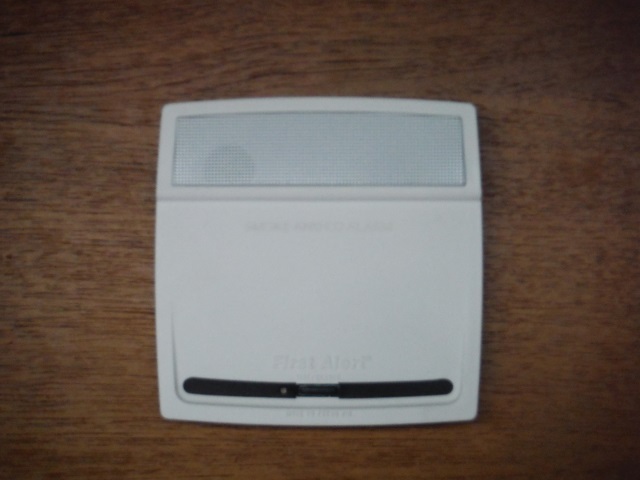 For now, we decided maybe First Alert isn’t our favorite brand of CO detector. We’ve purchased a unit from Kidde as a replacement. Since that’s the brand of our fire extinguishers as well and they are therefor of the same tribe, I’m hoping they’ll keep each other entertained and leave us alone to get some much needed sleep. This entry was posted in What?, Why? on April 10, 2015 by Robert. So, this is my first official blog post! While Robert, now being retired, is enjoying his time working on projects to improve Eagle Too, I am continuing to work until such time that Eagle Too is ready to go on this grand adventure and I am also able to retire. One of the many things I do miss now that we live on the boat are projects of my own—whether it is making a new flower bed, digging in the ground or helping Robert build things. Since I am continuing to work, clothing space is an issue. I have winter clothes (soon to be put into storage until next winter), spring/fall and summer clothes. And it’s not just work clothes, there are my play clothes – everyday clothes that I change into after work, and the soon to be bathing suit weather type clothes. (Ok, not much in that department but it still takes up space!) Storage is at a premium so you have to get creative when living in a smaller space than what you were used to. The “V” berth on Eagle Too is my area. Yes, I get a whole area! But that will change once I am retired. We will probably need to sleep up in the “V” berth when we are not hooked up to power for the A/C. There is better ventilation/air flow up there. 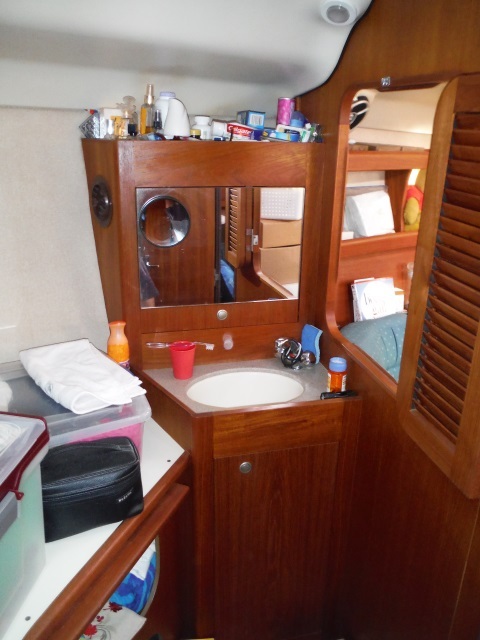 Unlike on Eagle, Eagle Too has a vanity with sink and mirror in the “V” berth. I can have my toiletries and makeup in the “V” berth without taking up valuable space in the head. Where Robert has all his gadgets and gizmos (tools and such) stored in cubbies here and there, I have kept most of my clothes and some boat shoes in the “V” berth. (Oh, and all towels and washcloths for both dishes and bathing share the “V” berth with me.) 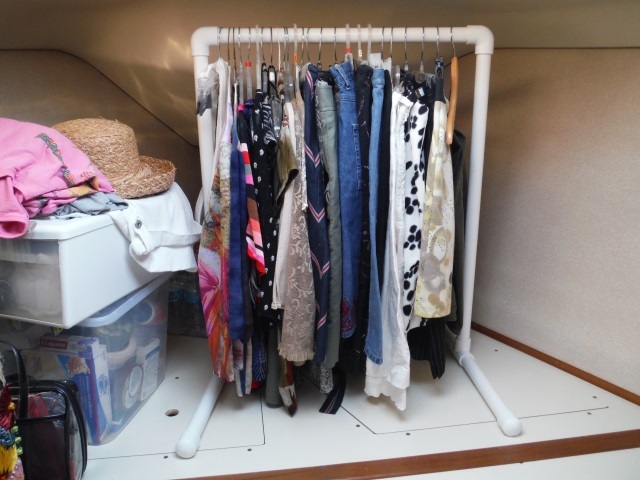 I had gone to the storage units recently (we have 3 units at this point) to take most of the winter clothes to store and bring out the spring/fall and summer clothes. Yes, I have WAY too much so I will have to pick and choose. But in the meantime, they all came down to the boat. So, I pondered, and looked on the web to see what I could find regarding a small free-standing clothes hanging item. The closet could hold my dresses and some other clothes but my clothes do share space with other unrelated items such as a small heater and a fold up rolling cart for when Robert sells his books (such as at the Pensacola JazzFest coming up on April 11 and April 12). Yep, I put a plug in for my husband! 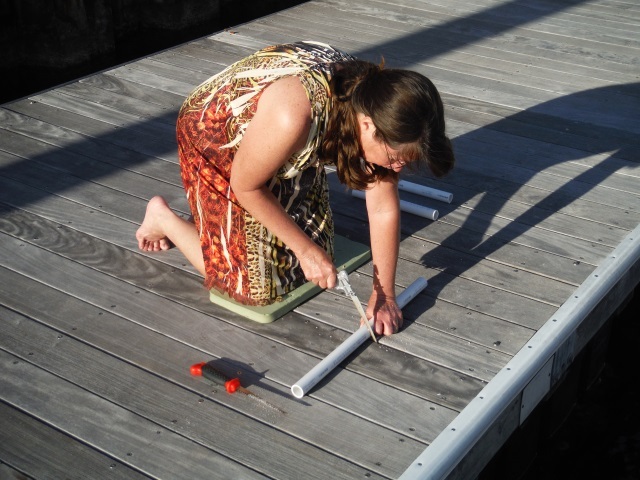 I am so excited about purchasing materials and going back to the boat and building it. Yes, not the most attractive piece of furniture, but, hey, I thought, executed, bought and made it myself and if I say so myself, it is doing what I made it to do. 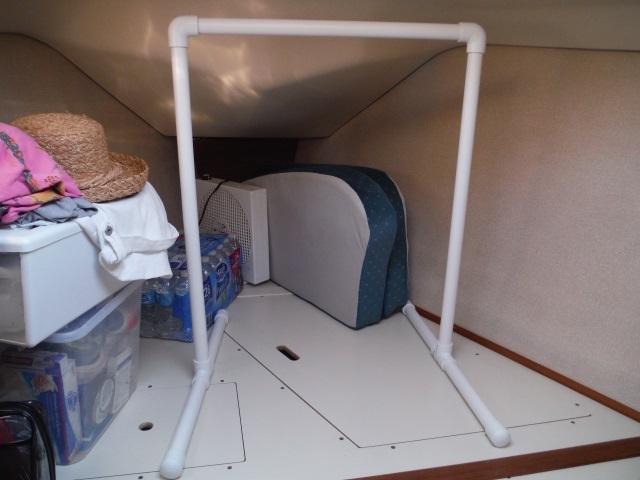 Now we’ll see if it will withstand the heeling when we go out sailing this weekend! So I now have a functioning clothes hanging device! And don’t start me on my shoe space. 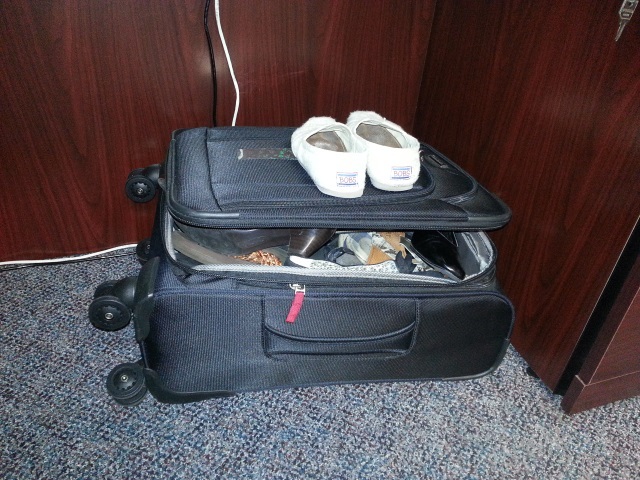 I solved that by having a suitcase under my desk at work. I go to and from work in a pair of slip on shoes and put a pair of more appropriate shoes on at work. It’s challenging to go up and down a ladder in heels! Oh, and stay tuned on where I am going to store all my fishing gear! This entry was posted in How? on April 8, 2015 by Robert.